This is Amazing – Mom exclaims as she has pressure waves! My beautiful, mellow Hypnobaby, Quinn, was born at 1:54 am on July 9th – her due date – after about 26 hours of labor and 5 hrs after my water broke. Although Quinn was my first birth baby, we also have a 19-month-old son, Josten (now 20 months), who my partner carried. So it was an interesting experience – being pregnant and going through birth after experiencing it all with my partner just a year and a half ago. At just around midnight on July 8, I was awoken by pressure waves, which, after I started timing them, were about 6-7 minutes apart and about a minute long. I couldn’t sleep through them so I got up to try and sleep sitting on the birthing ball, leaning over pillows on the bed. While I was up, the waves pretty much went away, but once I was on the ball they came back. Not comfortable there, I decided to try lying down again, but to no avail. All this time I was listening to ‘fear release’, ‘easy first stage’, and ‘birthing day affirmations’. Finally, I got up, went to the kitchen, ate a snack, and starting thinking, with excitement, about my birthing day, which I knew was near at hand. After awhile, I realized that the waves had all but disappeared, but knew that if I tried to lie down again they’d return. I then went into my son’s room and managed to sleep between waves on the glider, for about 2 hrs. At about 6:30 am I called the Birth Center where I was planning to deliver, and spoke to the midwife on call, who said it could be today, it could be next week! I knew, though, in the back of my mind, that it would be happening sooner than later. After another hour of sleeping between waves back in bed, my family got up and my partner, Haidee, asked if I thought she should stay home from work. I thought not, since my sister was going to be over that day anyway to help out, so she went off to work, I called in to work to say I wouldn’t be there, and an hour or so later my sister arrived. The day was spent mainly as usual, taking care of my son with my sister’s help, peppered by bouts of regular waves followed by periods of none. During a short walk I started experiencing intense hip pain (all of my hypnosis work did not seem to touch the hip pain, since I hadn’t really gotten the idea of directing my anesthesia to anywhere but the areas that I was thinking would be affected by PWs and birth!). I decided that it might be a good idea to get a chiropractic adjustment that afternoon, if possible, hopefully to fix the hip problem, but also just to get into prime shape for the potentially long hours ahead. After my adjustment, my hip was no better, but my outlook remained very positive, and in fact I continued to feel as I had all day – excited and ready to give birth to my baby. I had asked Haidee to come home early, since my sister had to leave for work, and once we were all home together again she called her mom to come over and help with Josten so that she could be attentive to me and get dinner made. My PWs continued to be off and on regular and then irregular, and I was able to take a bath for about 1/2 an hour, listening to my ‘birthing day affirmations’ CD. During dinner (pasta and lots of veggies for strength and energy), they became a bit more regular. Whenever my son was near me when a PW came, and I would stop in my tracks and say “peace” over and over until it was passed, he whispered “pssss” right along with me. He was very attentive and sweet with me, ready, in his own way, for his little sister to arrive. After dinner I went back to the bedroom and spent about an hour on the birthing ball as my PWs became regular – about 5 minutes apart and 1 minute long. At about 8:45 or so the PWs got closer together, and at about 9:15 my water broke as I squatted through a wave. I told Haidee, and it was definitely time to go to the Birth Center, but it took awhile to get out the door (packing up the rest of what I wanted to bring, etc). We finally set out on the 20 minute drive to the Birth Center at about 10:00. The ride in was actually quite comfortable for me, I just rode the waves and Haidee timed them on her phone’s stopwatch. They were now 3 minutes apart and lasting 1 minute each. I called the midwife and my parents, and texted with my sister on the way there, between PWs, and everyone was on their way (my parents were driving up from NJ and figured they’d arrive around 1 am). During the 1/2 hour it took to administer the antibiotics, my sister arrived. Haidee was applying pressure to my hips during my waves in the chair during this time, and my sister spelled her for a wave or two. It felt nice to have the pressure there, but I didn’t find it absolutely necessary, and was able to focus and breathe and chant Peace, Relax, Release as the PWs continued. Never once did I feel any sense of fear, nor did I experience pain, except in my right hip, but even that was perfectly bearable. I let Jill know that I’d like to get into the tub as soon as possible, so she started filling it, and by the time the IV was done it was ready for me to get into. Being in the water felt wonderful. I continued listening to my Hypnobabies tracks, and soon Haidee joined me in the tub. My sister played photographer, and another midwife, Laurie, joined Jill because there was a chance that another birthing mom might be arriving before I gave birth. 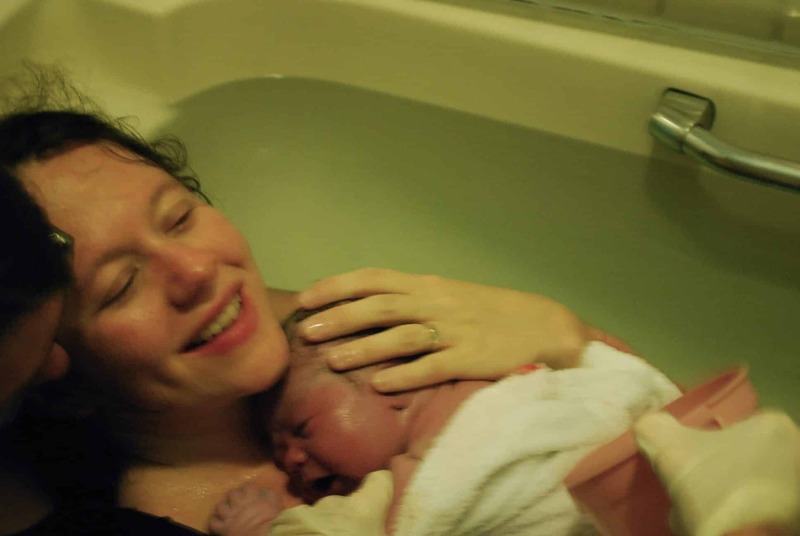 No one else did arrive during my time in the BC, so I had both wonderful midwives by my side the entire time, mostly being quiet and letting me do my thing, pouring warm water over my belly, and occasionally making suggestions for positioning my legs and body in the tub for optimum comfort. After about 20 minutes in the tub, my body started feeling pushy, and I just went with it, checking with Jill, who was completely confident in my body’s ability to know when to push. As I pushed through the next bunch of waves I found myself getting more and more vocal and loud, chanting/groaning OPEN, OPEN, OPEN and Release, while Haidee whispered “Relax” into my ear. midwives encouraged me to focus my energy into my core, shift my body so that I was grabbing my own legs and grunting low and gutteral sounds as I pushed, and this helped enormously in helping me move the baby under my pelvis and out. There were quite a number of PWs that felt to me like they should lead to the head crowning, and I started to get a bit antsy for it all to be over – not because I was in pain at all, but mainly because I was very tired and just ready to meet this baby! Apparently the midwives felt the same way, although no one gave me any indication that there was anything out of the ordinary going on. The baby’s heartbeat was steady and strong each time they used the doppler on me, so there was no concern, but it was just taking longer than they’d anticipated to get the head to crown and stay put. Finally it did, and Jill encouraged me to feel the full head of hair poking out between my legs. Everyone was marveling at the long hair floating in the water! Another push or two later, and the rest was very fast – her head came out, giving me a wonderful sense of relief and joy, and then I pushed again and felt her whole body just unfolding out of me. She was immediately on my chest; silent, calm, and as pink as could be (with Apgar scores of 9 and 10)! We all just stayed there for a while, marveling at what had just happened and looking at Quinn. It turned out that her hand had been next to her head as she emerged, and that was likely the cause of my hip pain and the longer time it took to move her out. The cord stopped pulsing, Haidee cut it, and then it was time for me to get out of the tub to birth the placenta. I was about halfway between the tub and the bed (maybe a 12 foot distance) when I felt a mild contraction, and a second later out plopped the placenta, right onto the floor! That was apparently a first for both midwives and after I was helped the rest of the way to the bed, as the mess was cleaned up, we all joked about the crime scene of blood spattered walls that would have to explained to the cleaning staff. I firmly believe that my ability to not just endure this birth without any pain edications or medical interventions, but to actually thrill in it (I clearly remember saying, after a few particularly intense PWs, “this is AMAZING!”), is due to my preparation using Hypnobabies, prenatal yoga, and by reading a lot of positive birth stories and childbirth research. In learning how fear and stress can affect a woman during pregnancy and birth, and about the idea that the experience of pain in (normal, uncomplicated) childbirth is a cultural construct born out of fear- and pathology-based western medicine, I was able to let go of that fear. In re-programming my brain, through self-hypnosis, to understand the experience as intense pressure, and as a positive, beautiful and exciting thing with a definite beginning, middle and end (even if the timing is unknowable), I was able to have exactly the (virtually) pain free birth that I was hoping for, and that I knew I could have. I’m so proud of you, Jen! Educating yourself about normal birthing, choosing Hypnobabies and trusting in your body, mind, baby and birth support team, you gave yourself and your precious child such an amazingly beautiful gift. What a beautiful birth story! Thank you for sharing and congratulations on your beautiful family!